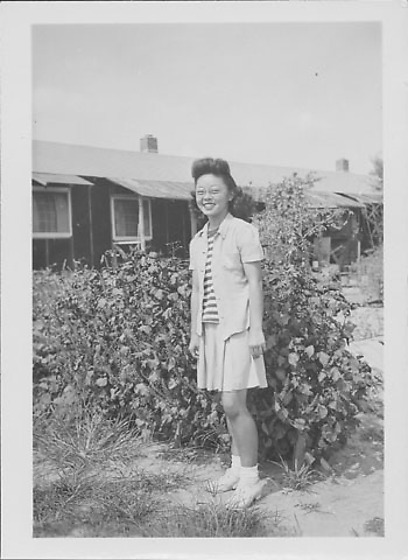 Full-length portrait of a smiling girl in eyeglasses, light-colored jacket over striped shirt and light-colored skirt standing in front of a flowering bush at Rohwer concentration camp, Rohwer, Arkansas. Monogram "BN" on breast pocket of jacket. She stands with her arms at her sides, turned slightly to the L. Barracks with brick chimneys, wooden awnings in background across C.